Listening to music is a favorable activity that everyone seems to have in common. Whether you’re into rock and roll, country or jazz, tuning-in with a quality pair of headphones can make a real difference. Rather than a small, in-ear variety, most high-end listeners tend to select over-ear, noise cancelling headphones. In general, these fully encapsulate your ears and do a much better job at keeping unwanted background noises from becoming a distraction. However, not all are created the same. In fact, most are quite different from another. Needless to say, selecting the right pair can become quite cumbersome. 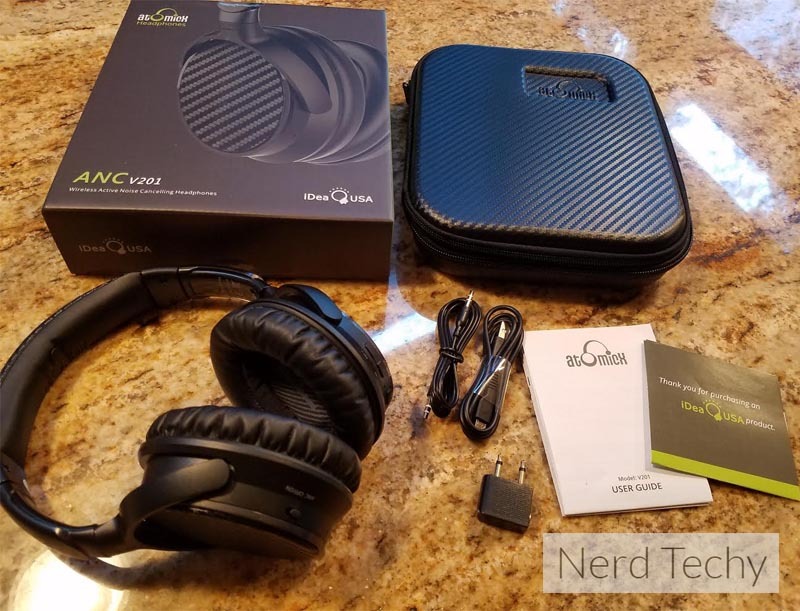 If you’ve been searching high and low for the right set of headphones, you may have already heard of the new AtomicX V201s. 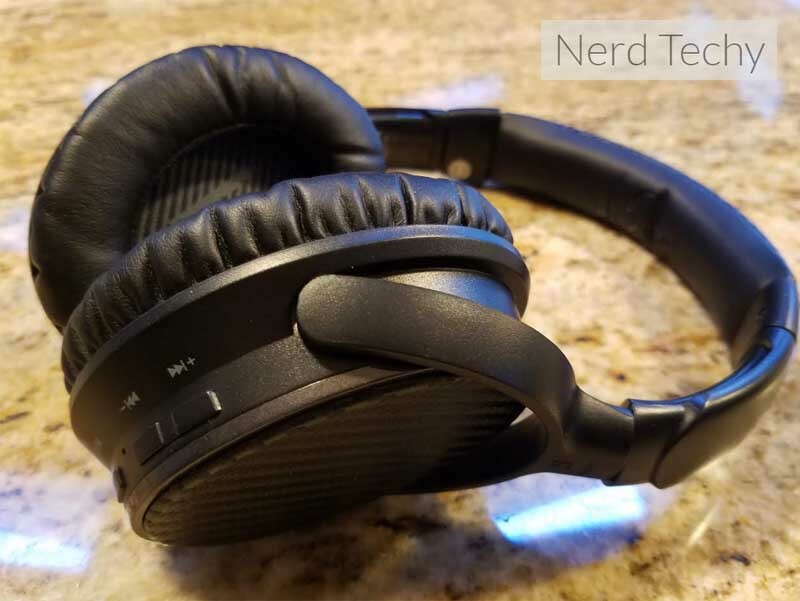 Manufactured by iDeaUSA, these noise-cancelling headphones seem to offer quite a bit. But how do they actually perform and are they even worthwhile? We were lucky enough to receive a free pair for our honest and thoughtful review of them. We’ll take a close look at them to discover more about how they function, their noise cancelling, comfort, battery life and more. This will give you a clearer and more insightful vision of them before you decide to make your purchase. Upon opening the box, we were delighted to find that the iDeaUSA AtomicX V201s came securely enclosed in a protective zippered case. With ample padding and plenty of durability, it’s nice to see that iDeaUSA included something like this. Additionally, it’s much slimmer and more compact than we expected, so that’s definitely a bonus. Inside the case is where the headphones were located, along with a micro USB charging cable, aux cable and aux-splitter. Picking them up for the first time left us with a good impression. The headphones feel solid yet soft and supple along the headband and ear cups. 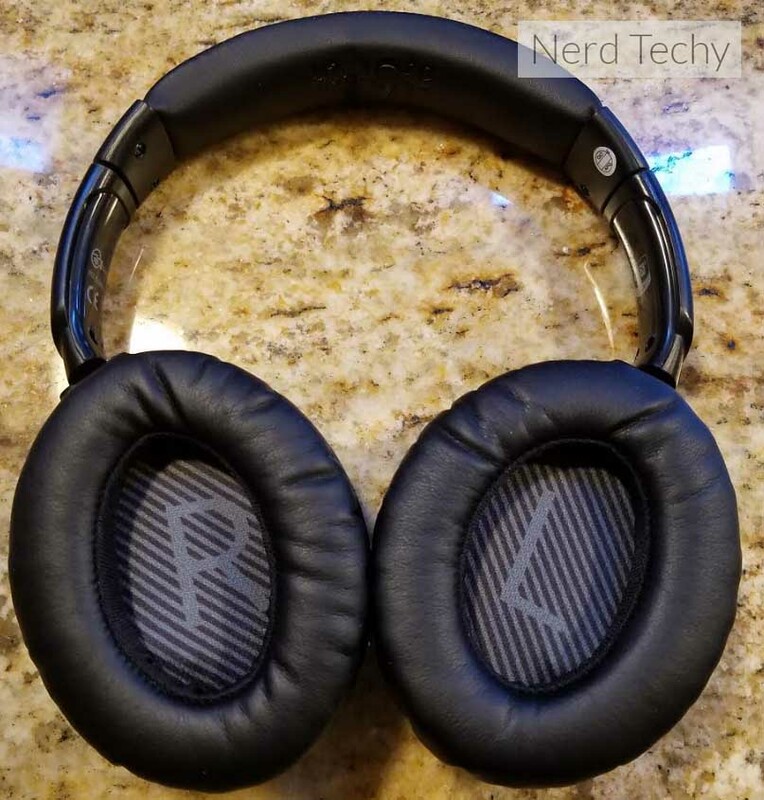 Although they’re comprised mostly of plastic, they feel quite sturdy and high quality while keeping a relatively low-profile with a lightweight design. Taking a quick look at the inner earcup, you’ll notice a distinctive L or R representing which ear goes into each cup. Take note of this because the design is specific to a proper fit. If you’re not wearing them correctly, the noise cancelling won’t be as effective and your comfort will surely be compromised. Once placed over your ears, you can slide the headband to your desired size. Make sure they fully encapsulate your ears so all of the grey noise around you is instantly muffled. Once you’ve achieved a fit that you’re happy with, it’s time to pair them and start listening. 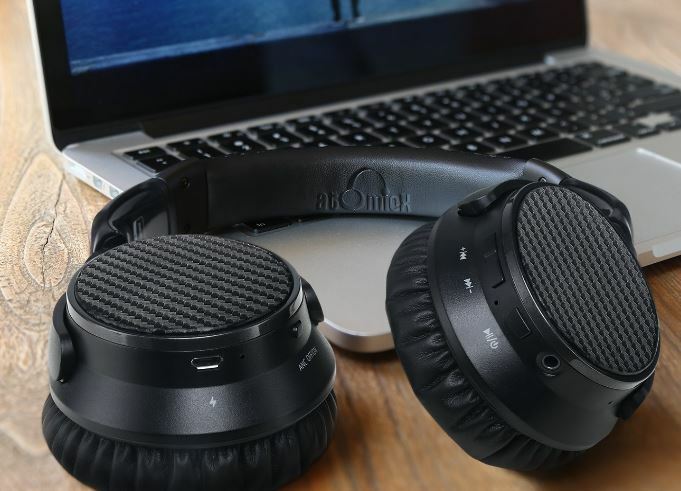 Since the AtomicX V201 headphones are wireless, you’ll need to pair them with a Bluetooth enabled device to take full advantage of them. Virtually any modern smartphone, laptop or tablet will suffice. On your device, simply make sure Bluetooth is turned on and searching for available connections. At this time, turn on the headphones by pressing the small power button located on the underside of the right earcup. You’ll immediately hear a voice prompt stating “power on”. At this time, the headphones will automatically pair and be ready to use within a matter of 30 seconds or less. Wait for “connected” and test them out by playing any song or audio track on your device. Best of all, you won’t need to go through this process more than once per device. Your profile will be remembered so next time all you need to do is power them on and you’re good to go. Since they’re wireless, you’re limited to about 30 feet of connectivity before transmission becomes problematic. This is typical of any Bluetooth headphone, as everything that’s wireless has its limitations. We found the range to work much better via line of sight than with an obstruction in the way. Fortunately, we couldn’t imagine being too far away from our paired device, so the wireless range is definitely acceptable. Once you’ve successfully paired the headphones, you’re ready to listen to whatever you please. We’ve been actively testing the V201s for over a week now and have been very pleased with their overall performance. Each genre of music seems to sound evenly impressive with no unwanted distortion or “tingyness”. The bass isn’t incredible but it’s definitely sufficient, although not adjustable. We do believe, however, that it’s set at an ideal level to balance out the high and low tones better. Inside each earcup is a 40mm driver that delivers dynamic sound with vibrant detail. In part, thanks to the aptX codec that the headphones are equipped with. This is the same kind of technology that’s behind many of the world’s best smartphones, speakers, headphones and soundbars. Sound is delivered clearer and much more efficiently this way. One of our favorite features is the active noise cancelling. Activated by moving a small switch located on the left earcup, the “ANC” is quite nice. Once you turn it on, you’ll immediately notice a more immersive and deep sound experience. It’s quite difficult to explain over writing, but it essentially dulls out all other background noise while drastically changing the sound. It seems to accentuate the bass and increase the treble so the lyrics are clearer and the instrumentals are more pronounced. This will, of course, variate depending on the specific kinds of music you’re listening to, but it’s a good generalization. The overall comfort is quite nice. 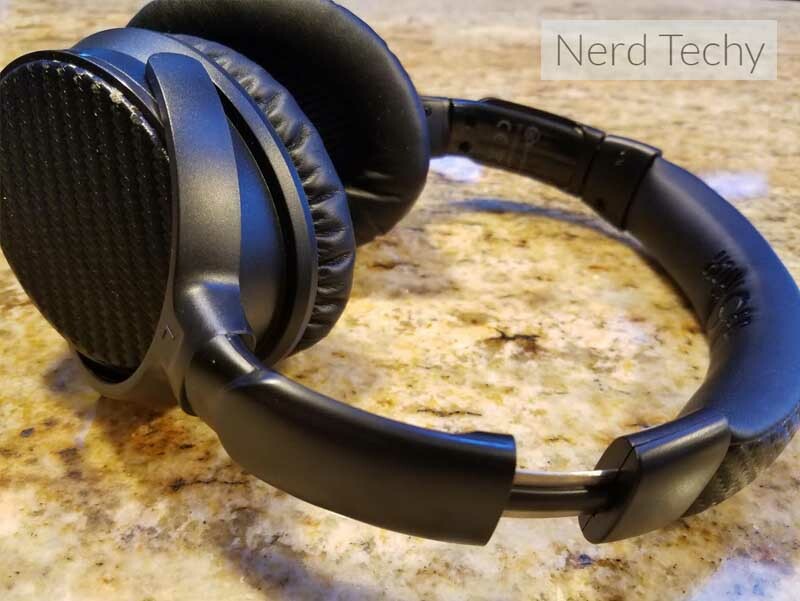 We’ve reviewed similar headphones in the past and are always skeptical about comfort. The V201s seem to be an all-around good choice for those who place comfort as a top priority. The headband pressure seems to be perfectly tuned – not too tight and not too lose. They hold quite still when worn properly, and there’s plenty of soft material around each ear cup and on the underside of the headband. 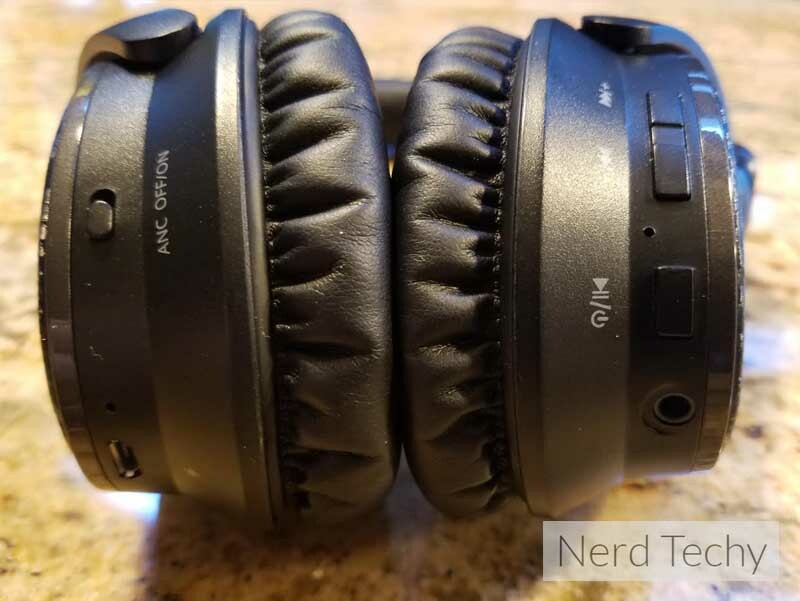 Since they aren’t built with an overuse of aluminum and steel, the AtomicX V201 headphones are incredibly lightweight and boast a surprisingly nice, slim form factor. While they’re designed with a rigid metal frame, they only weigh 210 grams, meaning that they wont’t cause any strain with hours of continuous use. This is a nice perk to have, especially if you plan on using them for extended periods. When you open up the V201s for the first time, you’ll notice that they come shipped with a partial charge. Enough “juice” left in the battery to pair them and listen for a couple of hours. However, you’ll need to make sure you fully charge them before attempting to use them to their full capabilities. 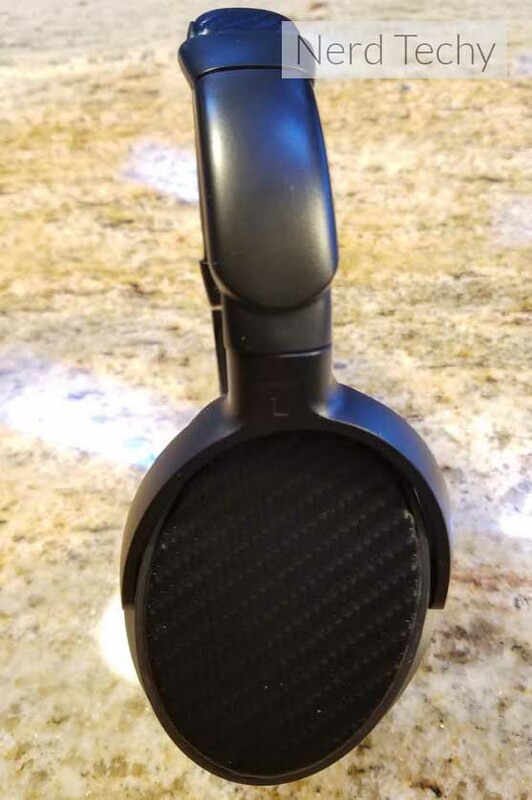 This is done by connecting the included micro USB cable to the input located on the left earcup. Once you’ve done that, plug them into any USB charger or USB outlet. The small LED will emit red when charging and it will turn off when fully charged and ready to go. Upon charging them fully, you can expect around 20+ hours of playtime. This is downright incredible and almost unheard of when we look at the competition. The secret is the internal 500 mAh battery that’s much larger than your typical headphone battery. Best of all, to achieve a full charge, you’ll only need to leave it for about 2 hours. 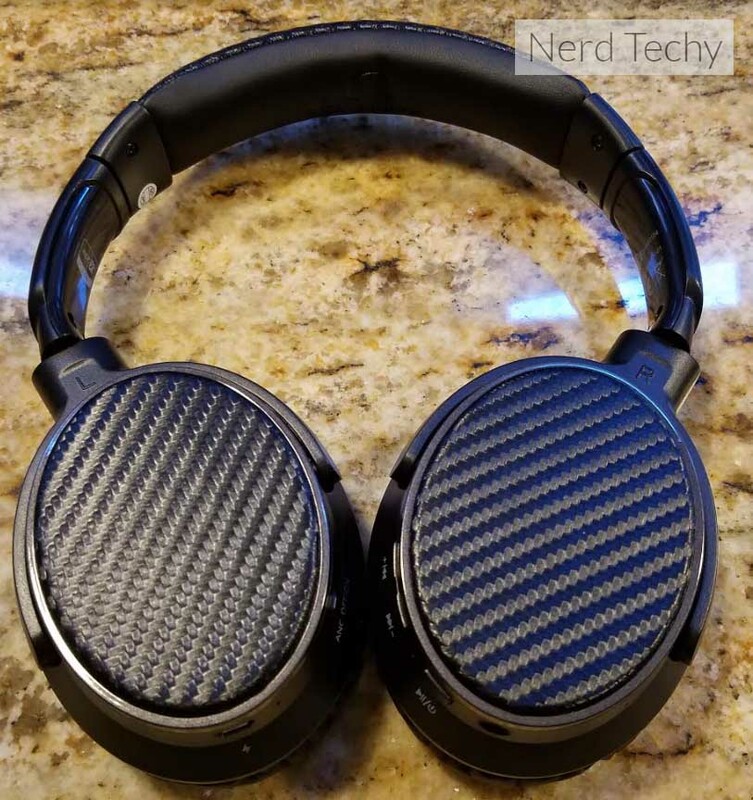 To sum it up, we really enjoy just about everything with the iDeaUSA AtomicX V201 headphones. They’re lightweight, cozy, and provide an excellent fit for heads of all shapes and sizes. And of course, the sound quality is definitely up to par. As long as you achieve a correct fit and utilize a high-quality music source, it’s easy to find enjoyment with them. Our favorite feature is the noise-cancelling – it really changes the listening experience and makes public listening much more enjoyable. With the ability to switch it on or off at-will, it’s truly suitable for all music lovers. Sure, they may not match-up to the five hundred dollar Beoplay H9 headphones, but for under one hundred bucks, you really can’t go wrong. One thing we really love about iDeaUSA is their satisfaction warranty. It assures that if you aren’t satisfied with them within the first 30 days of ownership, you can send them back for a full refund. On top of that, they come included with a manufacturers warranty that covers faulty headphones for the first year. Thanks for the article – but do you know how to actually check how much battery is left?